This downtime is to facilitate a database upgrade. If you have any queries, please contact the Service Desk (Tel. x5777 eMail servicedesk@nuigalway.ie). · Exam Processing Services (Academic Web Services for Staff and Students) including access to exam timetables, exam results, past exam papers and PAC. · Campus Account Self Service (CASS). This downtime is to facilitate an Oracle infrastructure upgrade. If you have any queries, please contact the Service Desk (Tel. x5777 eMail servicedesk@nuigalway.ie). Access to some Library services will be interrupted on Wednesday 30th July from 13:00 -21:00 to facilitate an Oracle Grid upgrade on the University’s Oracle production servers. Access to the catalogue will be as normal, but real-time item location information will be impaired for a time. No online renewal or online fines payment facilities will be available. The AWC us running a short summer camp for students who would like to improve their writing skills ahead of next year. We will focus on the writing process, grammar, and composition skills. Whilst the woodcuts are unsigned, it has been suggested that the item’s printer Francesco Marcolini may have been the artist. A contemporary and friend of Titian (approximately 1488-1576), he was himself an accomplished artist. A database of streaming psychotherapy demonstration videos; users may create playlists, clips, search transcripts of videos, and more. At the half-way point in this year's Galway International Arts Festival, it is a good time to catch a breath after what has been such a packed week of the festival. 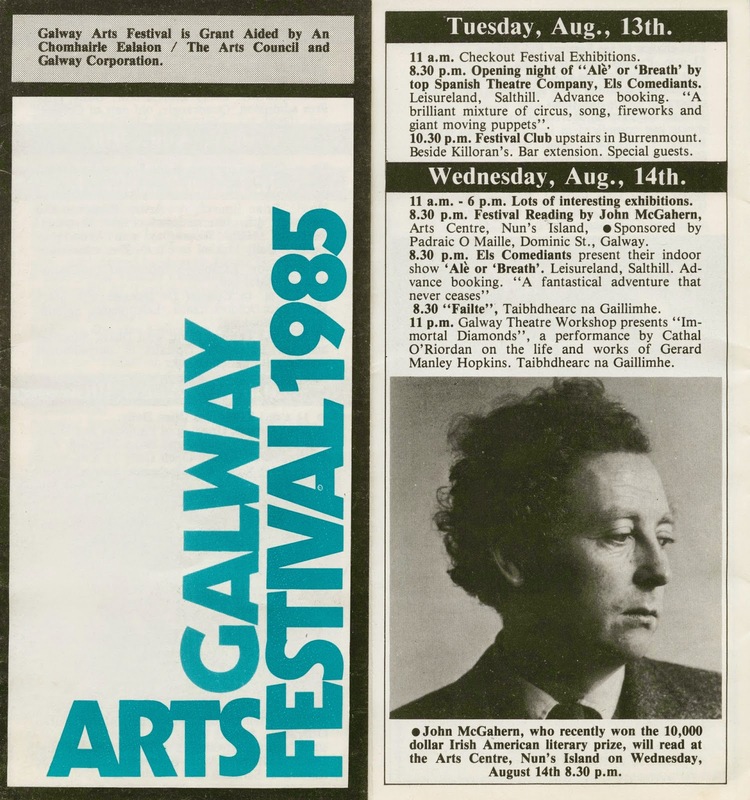 This year being the first 'International' Galway Arts Festival (though of course it always was International!) 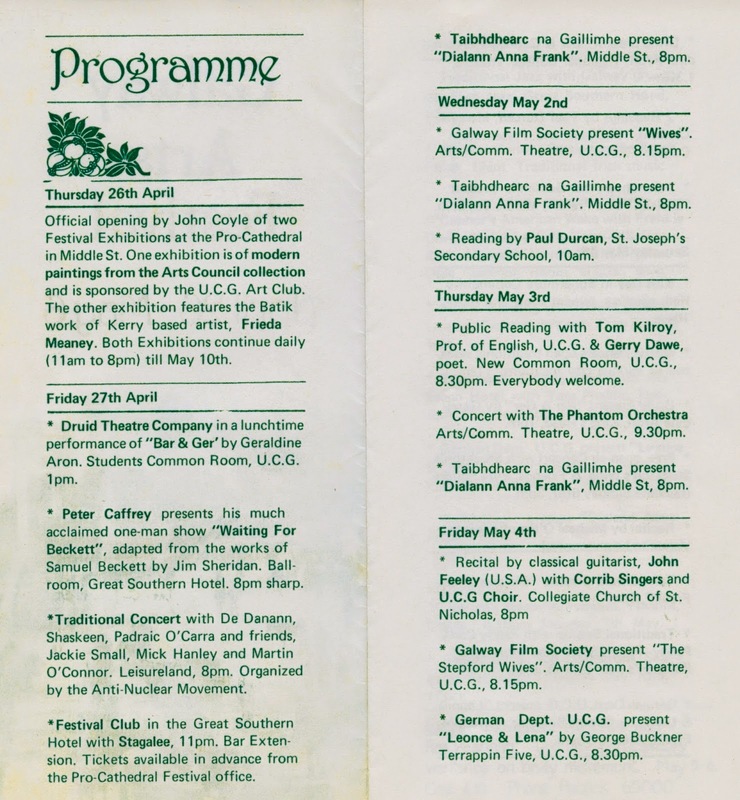 it is a good opportunity to open up the archive of the Galway Arts Festival and look back at some of the hits and big events from over the years. 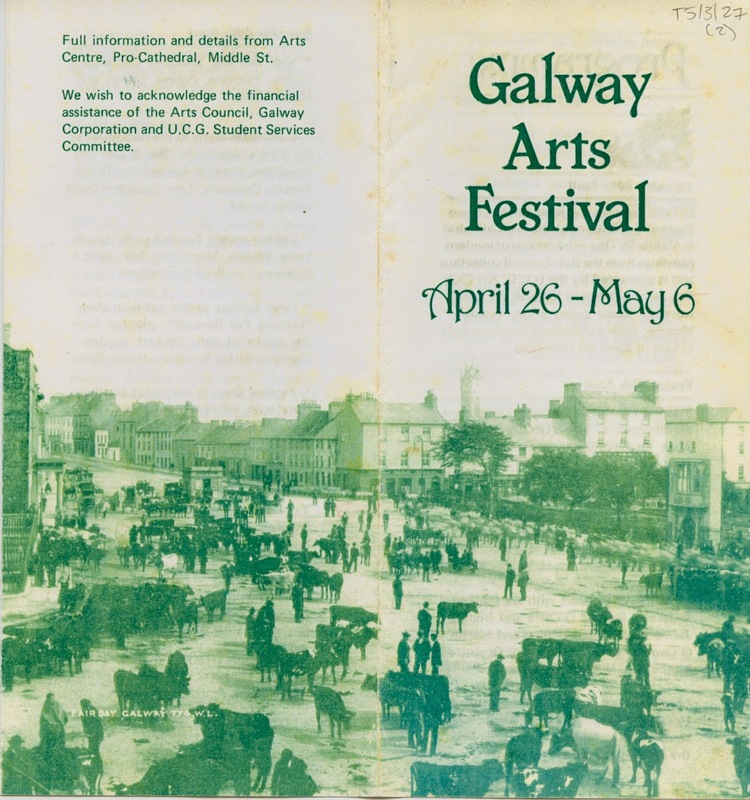 We are proud to hold the archive of the Galway Arts Festival here at the James Hardiman Library. 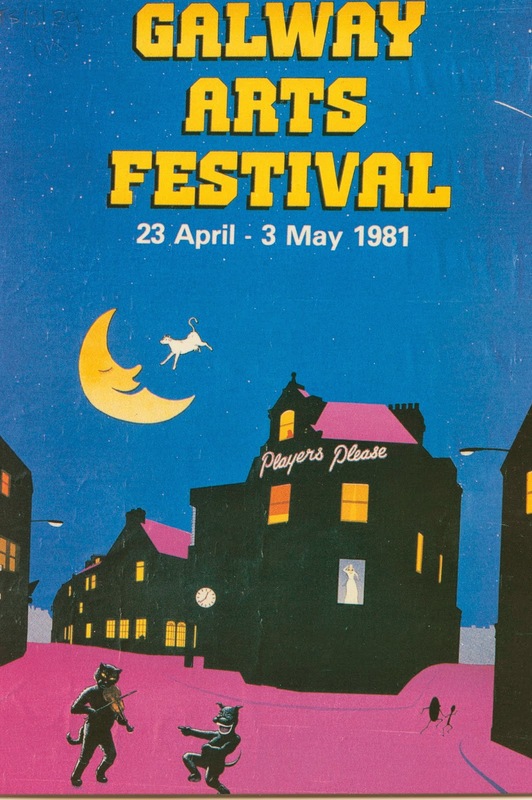 It is a rich resource of history, great memories, major names and acts from all spectrum of the Arts and a record of just how the Arts Festival has grown and developed over the years, where today it stands as one of the great international arts festivals. 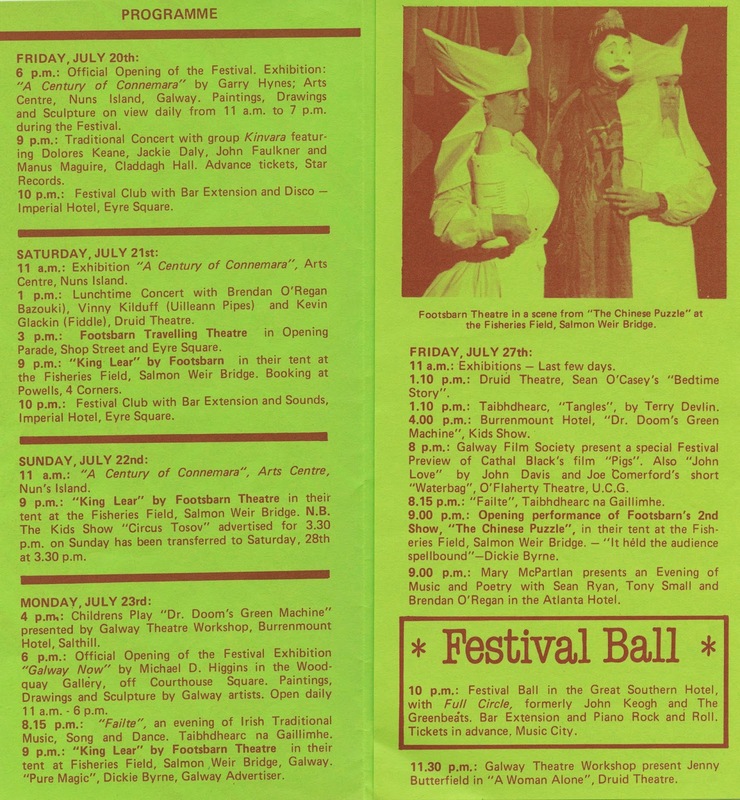 Here we open up some of the archives to see just how strong the programming was from its early years in the 1980s. Theatre names such as Druid of course stand out, along with Footsbarn Theatre Company and also a version ofWaiting for Godot by Jim Sheridan . Literary names are full of heavy-hitters like John McGahern, Seamus Heaney, Thomas Kilroy and Paul Durcan to name a few. 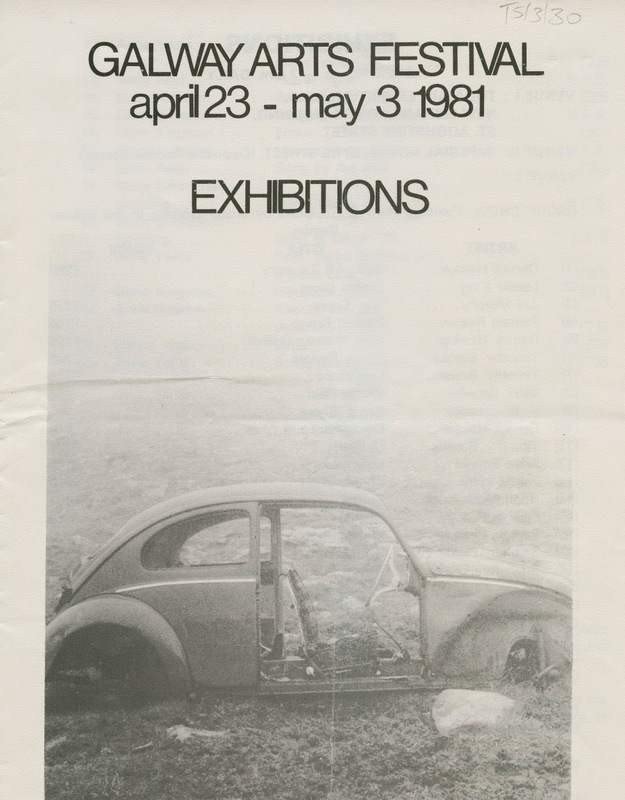 Art exhibitions from Robert Ballagh, Brian Boske, Patricia Burke-Brogan and others filled the visual art programme. Music from Padraig O'Carra, De Dannan, Doloros Keane, again to just but a few, were among the musical acts. 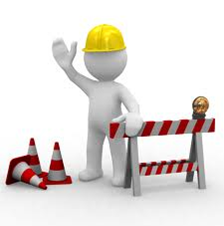 Unfortunately there will be some noise disruption on the western side of floor 1 of the James Hardiman Library in the vicinity of the PC Suite over the next few weeks due to building works. This work is necessary to facilitate the construction of new Group Study Room facilities. In order to avoid any impact on your work you are advised to study elsewhere on floor 1 or on an alternative floor. For those using the PC Suite area please note the availability of additional PC Suites on floor 2 and in the basement of the Nursing & Midwifery Library Extension. Please note that further to a recent upgrade there have been some minor changes to logging into and using Multi-Function Printers (MFPs). Access via swipe card remains the same; if accessing via the touchscreen the username and password screens are now split over two consecutive displays. Once signed in you are now taken directly into print mode – there is no need to press “PRINT” button. To move from print mode to copy or scan mode please press the relevant button on the machine or press the “JOB END” icon on top left corner the screen. If in copy/scan mode press the “PRINT” icon on the top hand corner of the screen. Information posters have been put up at each of the machines. First Year Academic Skills Support - Tell us what you think? Do your first year students lack the academic skills needed for success at University? Students we’ll be running a survey to get your views in a few weeks – watch this space! One of the more frequent questions we receive in the Library is regarding online access to the Irish Times. We have electronic access but not through a direct subscription via the Irish Times website. Instead we access through our databases. Current Irish Times content is available through Proquest, accessible via the Irish Times link above. The newspaper is updated on the database within a day of the print and the content - not images - are made available. The articles are listed in order by page from the newspaper and it can be browsed or searched by date. The Irish Times Archive is a more sophisticated resource providing the newspaper in a superb digitised format from 1859-2012. This database is an excellent research tool providing the paper as a social and historical resource with articles, photographs, supplements, advertisements -all the elements that compose a newspaper. The Nexis Newspaper database provides alternative access to the Irish Times covering the years from 1991- to present. It provides content but not images or digitised formats. It does, however also cover the Irish Independent, the Irish Examiner and a number of other national and provincial titles. Labels: Databases, digitization, e-Resources, Irish Times, Newspapers. On the 29th July 2014, the Library will host a Digital Collections Seminar. This event will showcase Digital Scholarship from NUI Galway (The Library, Moore Institute, School of Humanities, Acadamh na hOllscolaíochta Gaeilge, Whitaker Institute and Insight), UCD, and the University of Ulster. The aim of this event is to showcase innovation while also facilitating discussion and collaboration. Space is limited. We ask that you attend if you are involved in Digital Scholarship for teaching, learning, or research. Lunch is provided as part of the event. Booking is essential and closes on Thursday 24 July 2014. 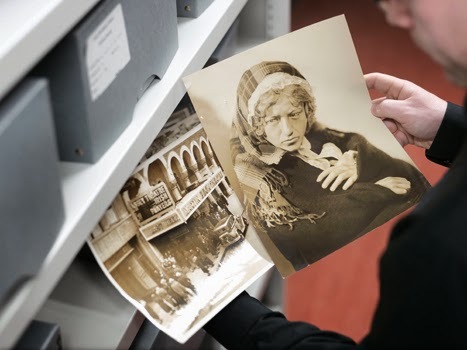 Beginning Thursday 17 July 2014, the Library will offer tours of and introductions to the collections and facilities of the Archives and Special Collections service. 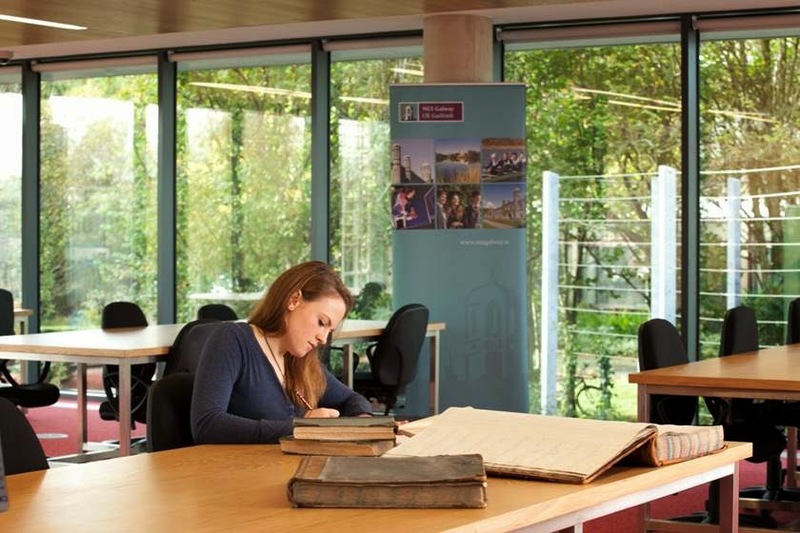 Visit and discover the treasures within the wide-ranging collections of the Archives and Special Collections, including historic local history collections, landed estates; rich literary papers such as John McGahern; world-leading theatre archives such as the Abbey Theatre Digital Archive; the Druid Theatre Archive, Taibhdhearc na Gaillimhe Archive and Thomas Kilroy Archive. 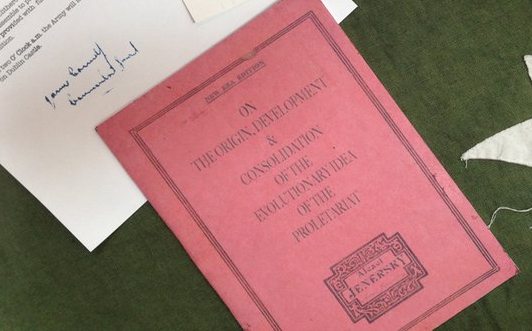 Learn about the tensions and struggles in Peace and conflict from our Northern Ireland collections, such as the Duddy, Boyle and Ó'Bradaigh archives and many other related and unique collections. 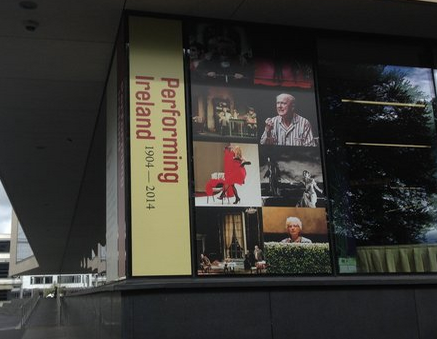 Also included on this tour will be a visit to the Performing Ireland 1904 - 2014 exhibition, currently on at the Hardiman Building foyer and being a digital journey through Irish theatre history. 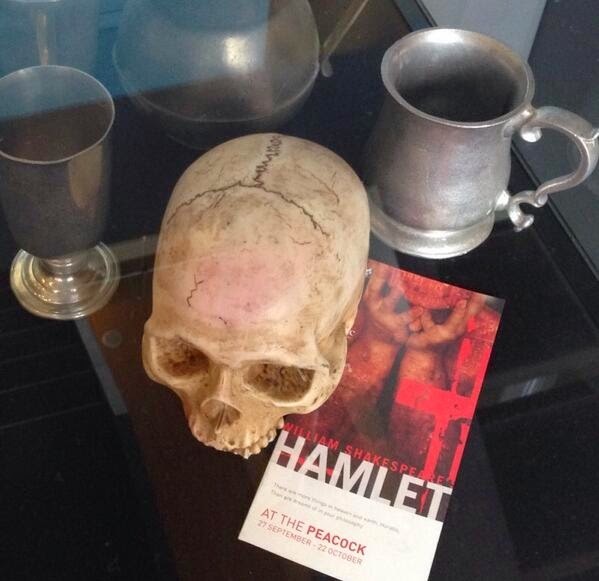 The tour will commence from the Hardiman Building foyer at 3pm. The personal library of the late Dr. Ros Dixon, collected over her lifetime of teaching, researching and writing about theatre, was recently donated to the James Hardiman Library, NUI Galway, by her family. 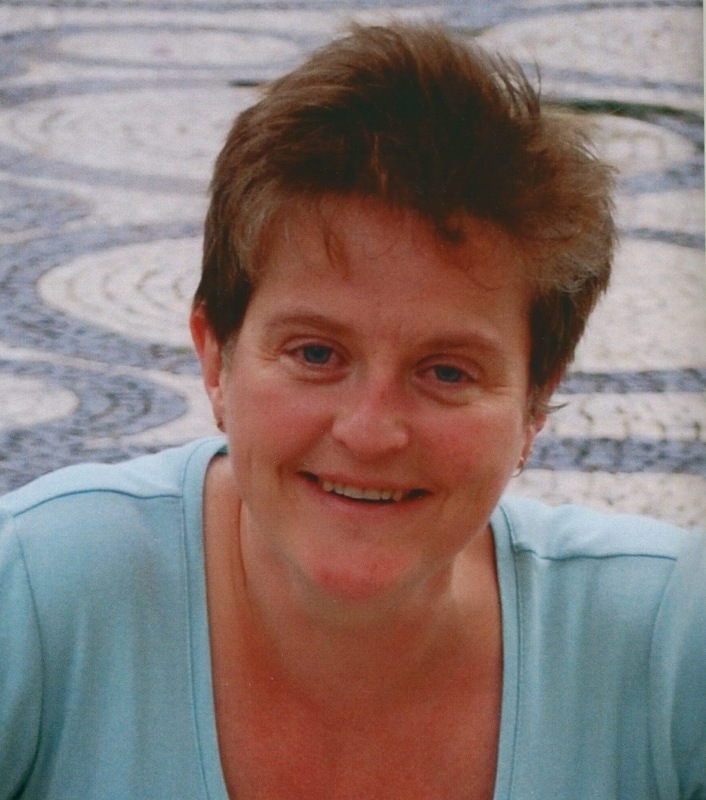 Ros was a highly esteemed and loved member of staff at the Department of English and was a recipient of the President's Medal for Teaching Excellence in 2006-2007. Her books and audio-visual materials concern theatre history, performance, playwrights, directors, and actors, with a special focus on plays in the Russian language and in English, including a collection of plays by, and biographies of, Chekhov together with Soviet history and playwrights of that era in Russia. 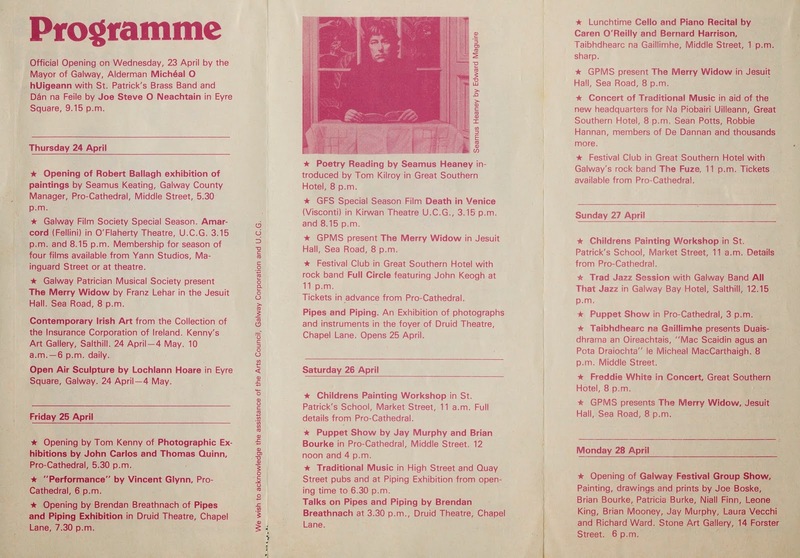 A vast collection of theatre programmes, in English and Russian reflect the many plays seen by Ros and a life spent engaging with theatre within Ireland and internationally. Ros' archive of research papers and notes offer a unique insight into her understanding, interpretation, teaching and writing about theatre and include detailed work on Efros, Chekov and Irish and Russian theatre in general. The love and commitment that Ros had for her students at NUI Galway continues with the donation of her library to support their education in drama and theatre history and performance. An event was recently held at the Archives and Special Collections Reading Room to mark the donation of her Collection to the Hardiman Library. The event was attended by many of Ros' friends, colleagues and family. Speakers at the event included Ros' partner, Dr. Elizabeth Fitzpatrick, Dept. of Archaeology, John Cox, Librarian, Hardiman Library, Prof. Adrian Frazier, Dept. of English. NUI Galway. A reading from Chekov's, the Cherry Tree, read by Max Hafler completed the proceedings. All books within the Dixon Library can be seen on the Library catalogue here. The Hardiman Library has developed a Vision Plan for 2020. We have widely consulted on this, visiting Colleges, Students's Union, Research Office amongst others We are positive and excited about the future of the James Hardiman Library as we move towards 2020. The vision document can be viewed here. The Library was delighted to be present at the recent Adult Learning and Professional Development Information Evening. Held in the foyer of the Orbsen Building, it was a great opportunity for Library staff to meet and engage with current and prospective students from Adult Learning. The packed foyer was a key sign of how important those undertaking Adult Education courses are to the University, with a range of courses and options represented. The conversations were interesting, the questions varied and it will be great to see all new recruits to Adult Learning as new users within the Library. 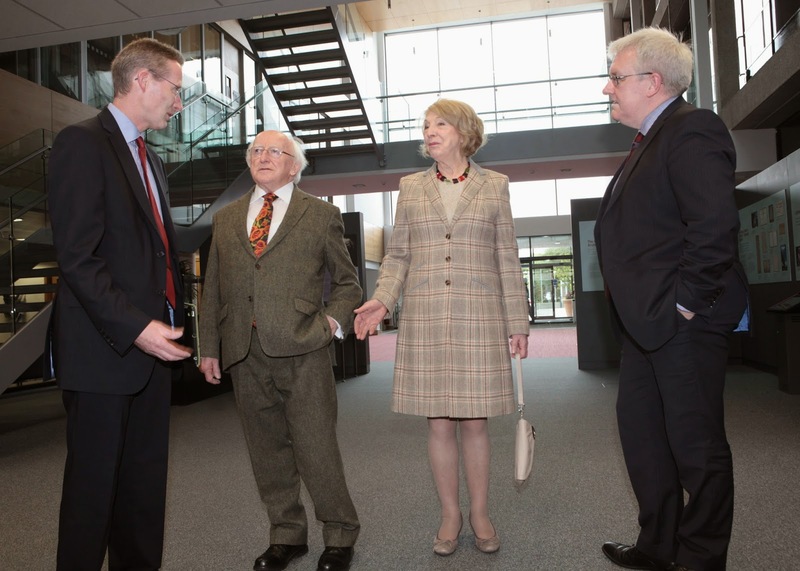 An exhibition entitled, 'Performing Ireland: 1904 - 2014' is on display throughout the summer in the foyer of the Hardiman Building. Celebrating a century of Irish drama and writing, and exploring strong links with the West of Ireland, the exhibition provides a digital journey through Irish theatre. Learn how the Abbey Theatre connects to the West of Ireland through Lady Gregory and WB Yeats, and the writings of JM Synge. Discover the craft of the playwright through the archive of Thomas Kilroy. 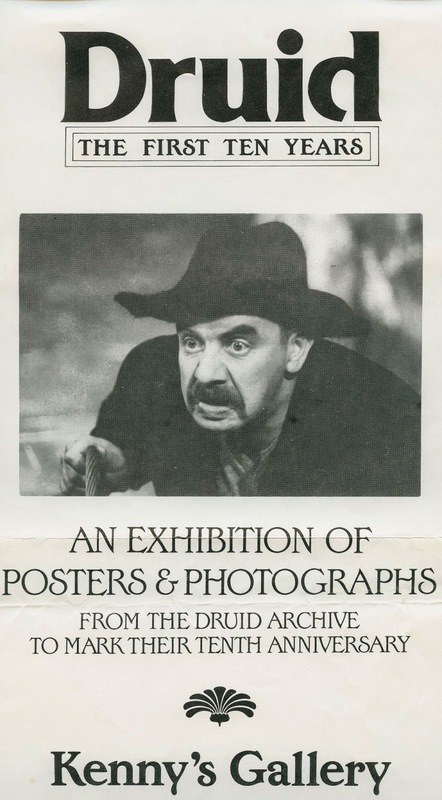 See how Druid theatre developed from Galway to Broadway as well as seeing first-hand the process and technology behind making digitally accessible over 1 million items from the Abbey Theatre's history . We are currently upgrading the search features of our online catalogue. It is expected that this upgrade, which incorporates some exciting new features, will go live later this Summer. With this upgrade, we will roll out some new features which we feel will enhance the user experience. Some of the new features include, Browse Search and the Virtual Shelf Tab. These new features are described below. To access Browse, select 'Browse Search' next to the simple search box, as shown below. The Browse Search page allows you to browse library material (local material only) by author, title, and subject heading. When you have done your search and you have results, you can select an underlined entry to see its associated records. Selecting on the entry link will bring you to the list of records. Browsing through the shelves of the library has always been a great way to discover resources. A Virtual Shelf tab has been added to the catalogue search results page. You can now browse forward and backward through items in our local collection. 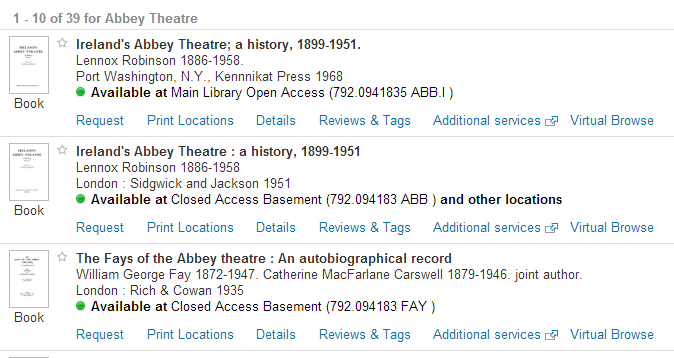 There will be more announcements with regards to the new search improvements to our catalogue in the near future. Local and international guests gathered at NUI Galway in May this year to join a symposium celebrating the work of the first Professor of Geology and Mineralogy at NUI Galway, then Queen's College Galway. The symposium marked the 150th anniversary of the research of Professor William King and his landmark research into the origins of Neanderthal Man, in 1864. 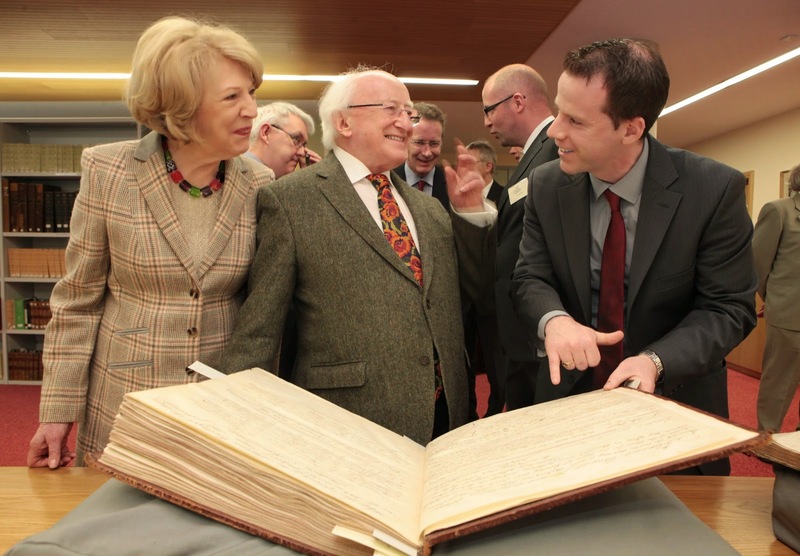 Among the series of events was a visit to the Archives and Special Collections Reading Room of the Hardiman Library by guests of honour, President of Ireland, Michael D. Higgins, his wife Sabina Higgins, Professor Svanto Pääbo, Director of the Department of Evolutionary Genetics at the Max Planck Institute for Evolutionary Anthropology in Leipzig and members of the King extended family, where they viewed the original records from the University Archives. The display included signatures by King in the 'Professor's Declaration Book' in which all staff and academics declared to uphold the ethos and standards of the College and also the noted registration of William King Jnr as a student in these formative years of Queen's College Galway. 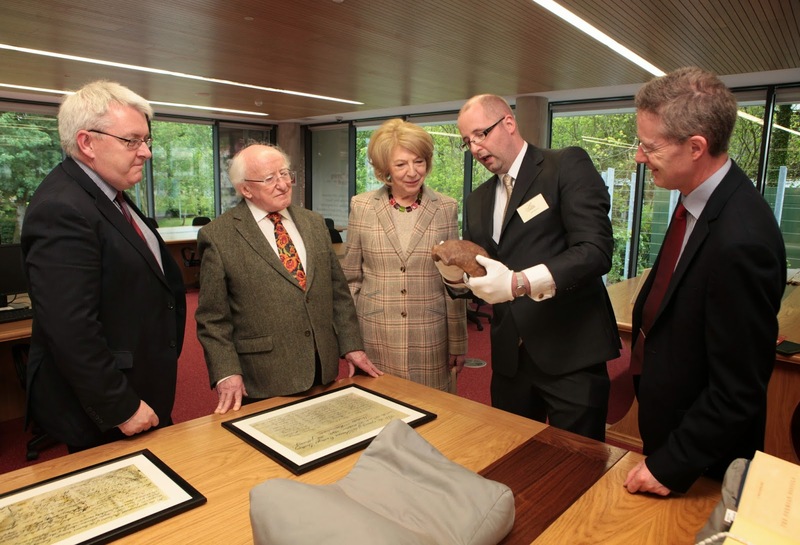 It is especially poignant to see both records of both King Snr and Jnr on corresponding folios within the College registers and was warmly received by the King family and by President and Sabina Higgins.The guests were greeted upon arrival at the Hardiman Library by John Cox, Librarian and Prof. Pól Ó Dochartaigh, Registrar and Deputy President of NUI Galway. Prof. King, a member of academic staff at Galway since its opening day designated Homo neanderthalensis as a separate species from ourselves. Organiser of the Symposium, Dr. John Murray of NUI Galway, suggested that the research by King in 1864 was both “extraordinary” and “revolutionary”. 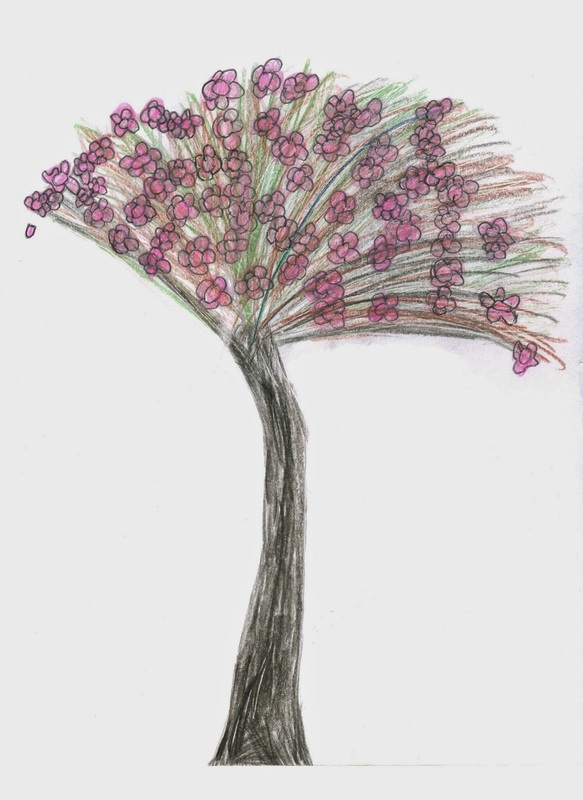 Placing the discovery in context, only five years previously, Charles Darwin’s Origin of Species had been published, putting King's research, from its base at Galway, to the fore of international thought. The geologist was the first, and one of just a handful since, to name a new fossil human species and establish its antiquity. the historic University Registers of Queen's College Galway. Also on display at the Archives and Special Collections reading room was a cast of the skull fragment of Homo neanderthalensis, that was used by King as part of his formative research while at Galway and which now is part of the collection at the Mitchell Museum of NUI Galway. 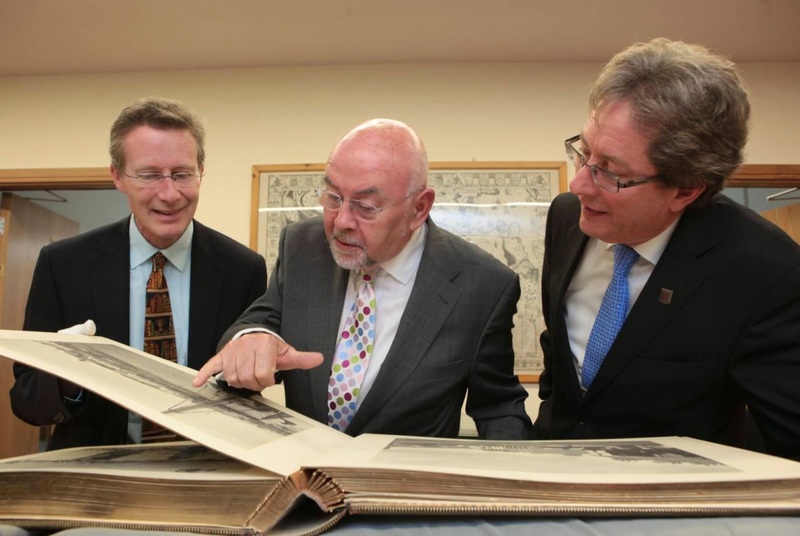 Dr. John Murray, Dept of Earth and Ocean Sciences, NUI Galway and John Cox, Librarian. The Hardiman Library was delighted to play a part in contributing this great event and extends thanks to Dr. John Murray and organising team. 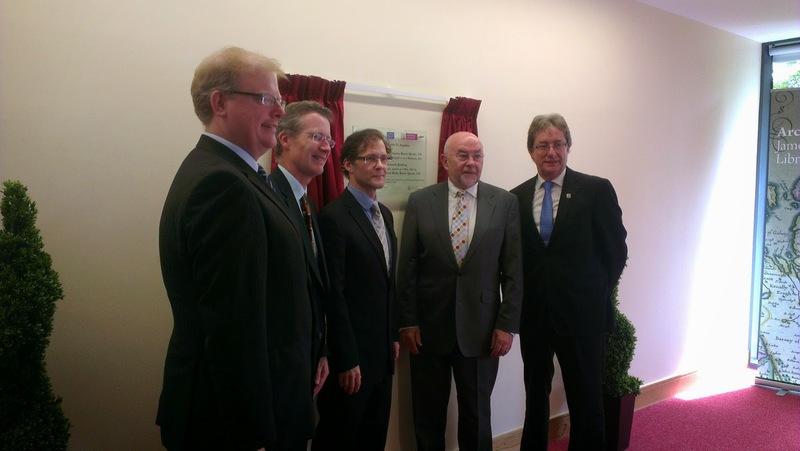 On the 1st May the Hardiman Research Building was officially opened by Minister for Education, Ruairi Quinn, T.D. 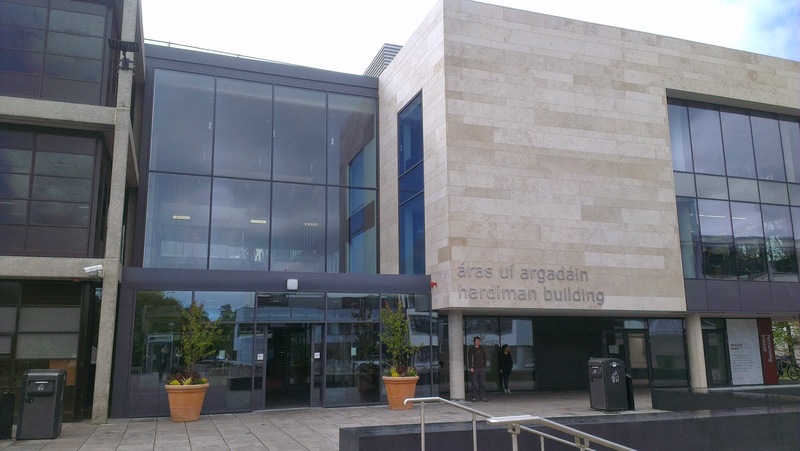 The Hardiman Building is an exciting development and a key departure on campus in that it will unite the unique research resources within the Hardiman Library with the Arts, Humanities and Social Sciences at NUI Galway. Located next to the Hardiman Library and at the heart of campus, the Hardiman Research Building comprises the new home for Archives and Special Collections, Digitisation, Research Support and other Library services as well as creating a collaborative space for research with the Moore Institute for research in the Humanities and Social Studies, and the Whitaker Institute for Innovation and Societal Change located on the upper floors of the building. The Moore Institute is a leading voice in digital humanities, medieval and early modern history, literature, travel, and cultural encounter. The Whitaker Institute, honouring the enduring contribution of public servant T.K. Whitaker, is the largest national business and social science institute on the island. 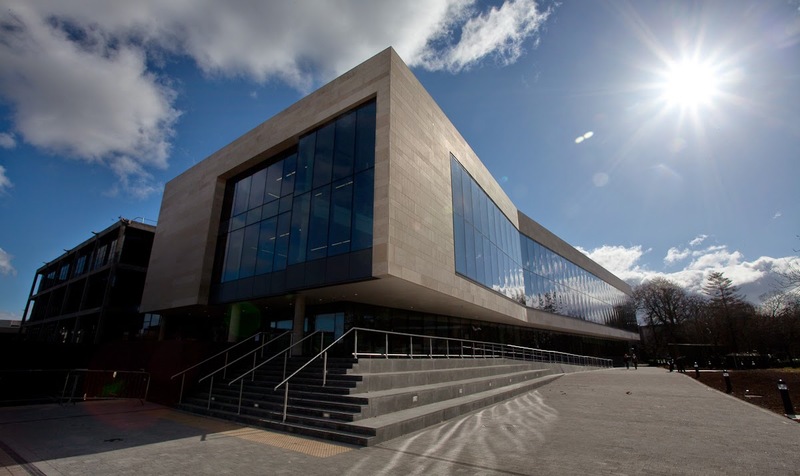 The Hardiman Research Building, recently named the 2014 Irish Building and Design Architectural Project of the Year, is also home to NUI Galway’s unique collection of more than 350 literary, theatrical, political and historical archives. The Hardiman Research Building will house the digitised Abbey Theatre Archive, the world’s largest digital theatre archive, under development since 2012. Other collections include archives of John McGahern, Thomas Kilroy, Druid Theatre, Brendan Duddy, Prof. Kevin Boyle, historic University collections and Irish language and landed estate collections. 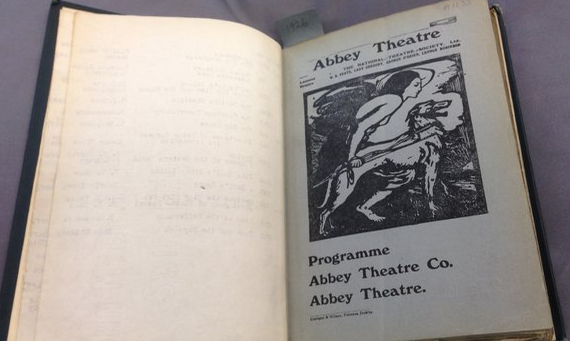 An exhibition of the digital Abbey Theatre Archive opens to the public for the first time today to mark the launch of the Hardiman Research Building. The ‘Performing Ireland: 1904-2014' exhibition features a taste of more than 1 million items that comprise the Abbey Theatre Archive. 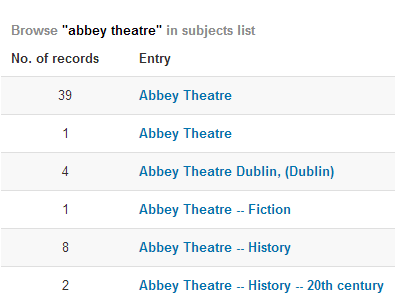 More on the Abbey Theatre archive can be seen here. Do You Know Your Subject Librarian?